Flossie Potter's '70s Triple Play is a classic style coat with three length variations for all seasons and occasions. They feature top-stitched seams from shoulder to hem and fur trim all around. The coats can be fully or partially lined and close with a hidden hook-and-eye at the waist. Pair the coats with Flossie Potter's Tam Cap & Ruffled Scarf for a sophisticated fashion statement, or with the cowgirl hat from the Town & Country pattern for that Rocky Mountain look. Then with the Shoulder Bag & Wallet, your doll is ready for town! This pdf sewing pattern contains 10 pages of instructions with full-color assembly photos, 4 pages of summary instructions (to save on printer ink! ), and 3 pages of full-size pattern pieces. Look for other Flossie Potter patterns in the 1970s collection at Pixie Faire. This was a great pattern to buy. The directions were very well written and easy to follow. I lined the whole inside of the coat and that was the only place that I made my own modification. Instead of using all of the individual pieces for the lining of the skirt area, I made a one piece pattern for the entire thing. It worked very well. I really struggled with the fir trim as I couldn't find black premade trim and bought a piece of fur instead! Never again!! I'll go wherever I need to find it with finished edges!!! Had fur everywhere and wasn't pleased with the finished edge that I had on the coat. Made the coat out of burgundy velvet with black fur and added a black fur hat. The person I was sewing for was VERY PLEASED with the result! Love this coat very easy to make. I've used both the fur and minkie for trim. Every girl needs at least one in her wardrobe. This coat pattern reminds me of a coat I wore in the 70's--same outline and fur only a brick red fabric. It goes together pretty quickly and looks very spiffy when finished. 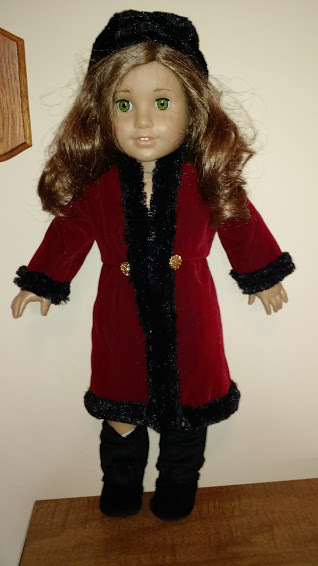 Yu will enjoy making it and helping to complete your doll's 70's wardrobe! !